The Southeast Texas Regional Alert Information Network (SE TEXAS RAIN) website is provided as a public service to provide information necessary to make important decisions during threatening weather conditions. Improving public access to this information was discussed by state Legislators in the Senate and House Committee hearings after hurricane Harvey in 2017. This regional project was developed from a Five-County coalition headed by county Judges from Hardin, Jefferson, Newton, Jasper, and Orange Counties. SE TEXAS RAIN will greatly improve information outreach to the public and is an important testament of regional coordination between the 5 County area of Southeast Texas. 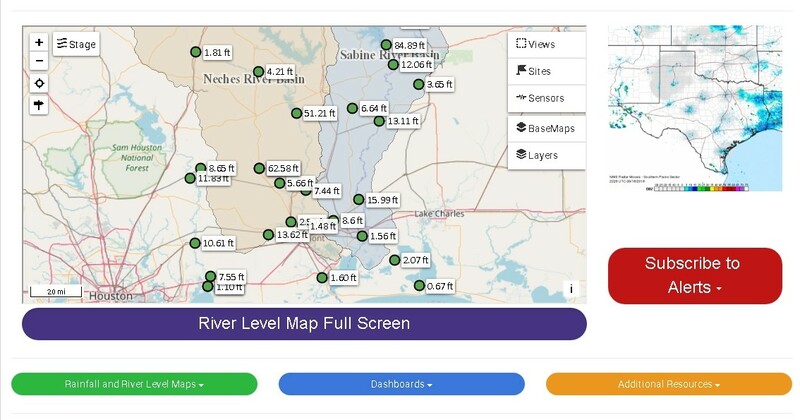 The SE TEXAS RAIN website displays rainfall, streamflow, and water levels in major streams, bayous, and reservoirs compiled from data sources which include the US Geological Survey (USGS) and The National Weather Service (NWS). SE TEXAS RAIN offers subscriptions for alerts by text (SMS) or email when stream and river gauges reach high water levels. The website also provides an address look-up feature to check on available gauge water level conditions and weather forecasts closest to your home or business while you are away. Click or tap below to see options for Alert Subscriptions, Maps, Dashboards, and Additional Resources.